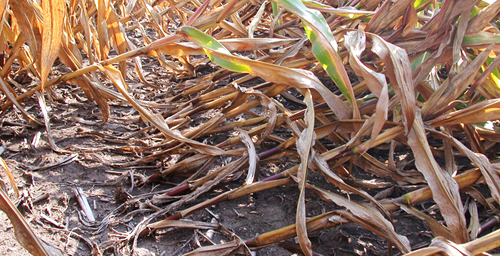 These Bt corn plants in LaSalle County, Illinois, have fallen over (lodged) as a result of rootworm damage. Like other Bt plants that are becoming susceptible to rootworm damage in Iowa, these corn plants contain the Cry3Bb1 Bt protein in a field planted year after year in corn expressing the same Bt protein. CHAMPAIGN, Ill. - High corn prices are leading many growers to plant corn every year and to overuse pesticides and other bug-killing technology to maximize yields, researchers report. In many instances, pesticides are applied without scouting fields to see if they are needed, violating a bedrock principle of integrated pest management. The result is a biological diversity desert in many corn and soybean fields in the agricultural Midwest, and signs that the surviving insects are becoming resistant to several key bug-fighting tools now available to farmers. 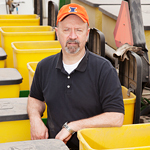 University of Illinois crop sciences professor Michael Gray found exceedingly low numbers of corn and soybean insect pests in a survey of 47 counties in Illinois in 2011. Despite these low numbers, and historically low densities of European corn borers, growers tell Gray they will use Bt corn and pesticides again this year. University of Illinois crop sciences professor Michael Gray and his colleagues conducted a survey of corn and soybean pests in 47 counties in Illinois from late July to early August in 2011, and found densities of some key insect pests to be at zero or near zero in many counties. "I've never seen anything like it in 22 years of doing this kind of research," Gray said. "From an insect diversity perspective, it's a biological desert in many of those fields." Even western corn rootworm adults (which normally lay their eggs in cornfields in late summer) were difficult to find in many counties, he said. In part, these low numbers are the result of environmental conditions - particularly wet springs - the past few years, Gray said. However, the widespread use of Bt-corn hybrids, which produce one or more insecticidal proteins, and the common practice of broadcasting mixes of insecticide and fungicide on corn and soybean fields also plays a role, he said. And yet, when Gray asks farmers at growers' meetings if they plan to use Bt corn again this year, a huge majority says yes. "Many producers indicate that in order to have access to high yielding germplasm, the use of Bt hybrids is essential," Gray said. "It is likely that many growers also will use a soil insecticide at planting, even though a Bt hybrid will be used." This goes against decades of advice from researchers like Gray who argue for integrated pest management - the careful assessment of bug populations to determine what, if any, treatments are needed, and the use of changing tactics against adaptable pests such as the western corn rootworm and the European corn borer, either of which could devastate corn yields. "We ask them to consider rotation with soybeans, to spray only when insects are present at levels that are likely to affect yield, and to not use Bt every season, or if they do, to get a different type of Bt corn, one that expresses a different Bt protein," Gray said. But instead of using integrated pest management, growers are relying on what he calls "insurance pest management," throwing everything in their arsenal at the bugs to protect their crop, year after year. "For corn in Central Illinois, the average non-land costs - things like fertilizer, seed, crop insurance and machinery - come to about $513 an acre," Gray said. Cash rent can add another $325 an acre for high-yield ground, he said. "So I think a lot of the growers see $20 to $25 dollars to apply a soil insecticide as pretty cheap insurance to protect that $850 investment." Most growers are not likely to be alarmed by the low number of bugs, but will instead see it as proof that their strategy works, Gray said. Other evidence, however, suggests that the short-term benefits will lead to unanticipated - and undesirable - consequences. Researchers are already finding failures of Bt corn against the western corn rootworm in Iowa, Illinois, Minnesota and Nebraska, for example. In a study published in 2011 in the journal PLoS ONE, Aaron Gassmann and his colleagues at Iowa State University demonstrated that the offspring of western corn rootworms from rootworm-damaged cornfields in Iowa were less susceptible to a particular Bt toxin (Cry3Bb1, the type of Bt in use in the damaged fields) than the control population. Gray has seen the same kind of severe rootworm damage in Illinois fields planted with the Cry3Bb1 variety of Bt corn, and he is collaborating with Gassmann on a new study of the Bt failures in Illinois. As yet, the researchers have not confirmed the cause of these Bt failures and are working to determine the mechanism. "Like the fields Gassmann studied in Iowa, the failures here in Illinois are in fields planted in continuous corn for many years with no crop rotation, using that same Cry3Bb1 Bt protein over and over again," Gray said. Growers' confidence in Bt corn probably stems from its great success against the European corn borer, a pest accidentally brought to the U.S. in the early 1900s. The insect arrived in Illinois in the late 1930s. "It was a devastating pest," Gray said. "It was a major yield robber." Western corn rootworm larvae do the most damage to roots, however, and expression of Bt toxins in roots is much lower than in above-ground tissues. This means that the rootworms are getting a much lower dose of specific Cry toxins than the corn borers do, Gray said. Add to that the fact that some growers are ignoring the buffer requirement while also planting Bt corn year after year, he said, and you've got a recipe for resistance. "We might not be having this conversation if corn was $3 a bushel and growers were asking us where to put their limited resources," he said. "But with these high commodity prices the notion of adding inputs to squeeze out a couple of more bushels seems like cheap insurance." A paper describing corn producers' failure to adopt integrated pest management practices appeared in the Sept. 27, 2010, Journal of Agricultural Food Chemistry. Gray will present his latest findings at the International Integrated Pest Management Symposium in Memphis, Tenn., in March 2012. Editor's note: To contact Michael Gray, call: 217-333-6652; email: megray@illinois.edu. The 2010 paper, “Relevance of Traditional Integrated Pest Management (IPM) Strategies for Commercial Corn Producers in a Transgenic Agroecosystem: A Bygone Era?” is available online or from the U. of I. News Bureau. A report on Michael Gray’s insect surveys in Illinois is available online.